Video Production & SEO (Part One) | Rewatchable, Inc.
At Rewatchable, we’ve helped customers with both video production and SEO for many years. For those unfamiliar, SEO is short for Search Engine Optimization which is essentially the practice of optimizing a webpage to increase the likelihood the web page shows on the first page of Google and other search engines. Of course, most companies have been trying to optimize their webpages for search engines for many years but few optimizers know ‘the power of video’ when it comes to getting found on the web. For most search terms, there is a tremendous amount of competition from thousands and thousands of other webpages. A new webpage has little chance of beating out a webpage that has been up for years, optimized correctly and linked to from many other websites. A website with a track record and repeat visitors has a real advantage over a new website or even an older website trying to compete in a new category. So how does a newcomer compete? The answer is video. Video can help in a number of ways. First, Google looks at a webpage with video on it as more dynamic and as better content to serve up to web searchers. Maybe not that big of a deal, but the theory is a webpage with relevant video on it is more likely to have been built by a human being and the page is not just a bunch of spammy text created by a robot. Even more important than on-page video are the videos that show up as standalone thumbnails in the Google search results. The reason videos that show up in search results are so important is there are far fewer videos for almost any given search term as compared to available webpages for the same search term. Simply put, there is much less competition. Let’s look at an example. The first customer we ever helped with VideoSEO was a small coffee shop in Salem, MA called Jaho Coffee. Jaho is what is known as a “siphon coffee shop.” Jaho wanted to make sure if anyone ever Googled “siphon coffee shop” Jaho would be found. The problem was there were over 100,000 webpages related to that same term. But the good news for Jaho, is that to this day there are still fewer than 200 videos from YouTube that come up for that same search term. We knew we could help Jaho if we could create a video for them and optimize it so it would be likely to show up in Google and other search engines. We produced a video for them, placed it on YouTube with the right tags (did some other magic) and within days the Jaho video was showing up on the first page of Google. 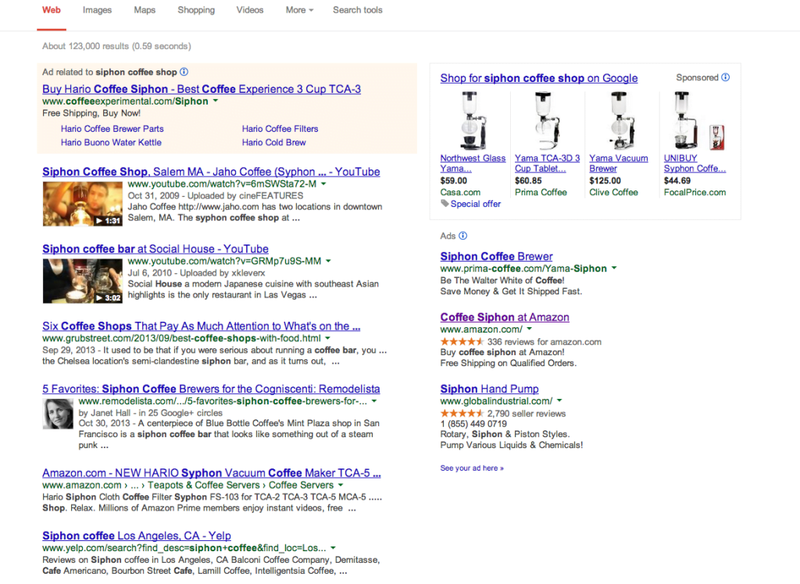 The video still consistently shows up as the number 1 result in Google for the term “siphon coffee shop.” At this point, the Jaho video has gotten more than 23,000 views from around the world along with many, many new customers. Check back for Video Production & SEO (Part Two) Coming soon! Rewatchable is a Boston video production company based in Beverly, MA.